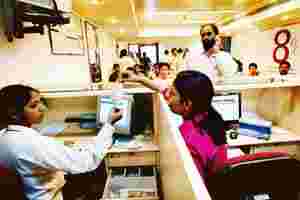 Mumbai: Customer complaints about banking services during 2008-09 increased by 44%, with a majority related to credit card services followed by the failure to meet commitments, the Reserve Bank of India (RBI) said in a report. State Bank of India (SBI), ICICI Bank Ltd and the local unit of HSBC Holdings Plc saw the largest number of complaints filed against them, according to RBI data. The number of complaints against public sector banks, which meet some 70% or more of India’s banking needs, was the highest at 33,141, up from 25,694 during 2007-08. Private sector banks and foreign banks saw 21,982 and 11,700 complaints filed against them, respectively. The SBI group faced the most—18,167—of the complaints against public sector banks. SBI, the nation’s largest lender, alone accounted for 15,306 complaints, with 4,295 related to credit cards, followed by 2,631 over failed commitments. Credit card-related complaints rose to 17,603 from 10,107 a year ago. Foreign banks had 5,737 credit card-related complaints, against 5,950 for private banks. ICICI Bank, the largest credit card issuer in the country with around 8.5 million cards, saw 3,560 credit card-related complaints filed against it, followed by 1,914 filed for failure in meeting commitments made. Among foreign banks, HSBC saw the highest number of complaints—2,838, of which 1,418 were related to credit cards. “The credit card-related complaints could be associated with the customer being wrongly charged for a transaction not done by her. There could be disputes over certain charges levied by the bank," said the credit card head of a private sector bank who did not want to be identified as the bank is in its silent period prior to the announcement of its second quarter results. A significant number of complaints related to pension payments, especially in the case of public sector banks, and direct-selling agents, especially for new private sector banks, according to the study. “In case of pensioners, the common error made by bankers is when they are doing the dearness allowance computation," said an RBI official who did not want to be identified as he is not the official spokesperson for the central bank. The “banking ombudsman offices at New Delhi, Chennai and Mumbai together accounted for 44.1% of the total complaints received during 2008-09 compared with 36.3% during the previous year", the report said.